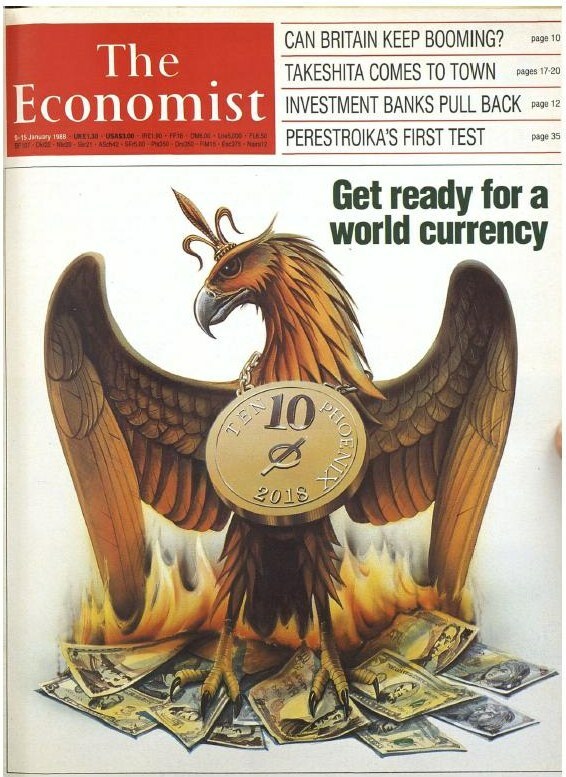 …It is the cover from the January 9, 1988 issue of The Economist magazine. Note the phoenix rising from the ashes of burning national currencies, including the dollar. Beyond the Rothschild and Agnelli families, who are widely rumored to be part of the Illuminati, the Schroder family is particularly worth noting. The Schroders (also spelled Schroeder) are an old German ruling class family from Hamburg. One of the Schroder brood, Johann Heinrich Schroder, settled in London and founded J. Henry Schroder & Co. (now known simply as “Schroders,” one of the UK’s largest investment banks) back in 1818. Later, in 1923, the firm expanded into New York by establishing J. Henry Schroder Banking Corporation. It is here that they joined with the Rockefeller family through Avery Rockefeller. 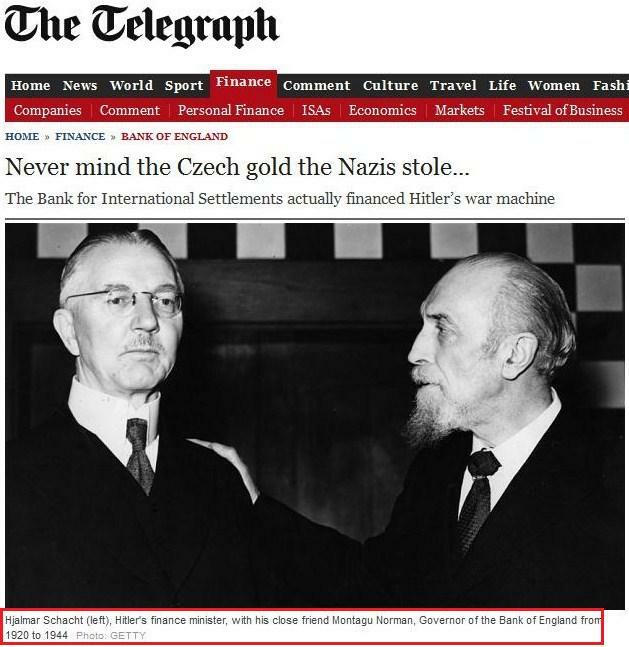 The Nazis had (and continue to have) deep ties to the Anglo-American banking establishment, and also to The Economist. So this article came from a publication connected to the supposed “Nazi/Zionist Cabal.” Keep this in mind as we take a look at what that Cabal’s supposed enemies, the Chinese, are saying about the currently unfolding global financial drama. >>> Caruana’s warning was reinforced by William White, head of the Economic Review and Development Committee at the headquarters of the Organization for Economic Co-operation and Development in Paris. As one of the very few experts who accurately forecast the 2008 crash, while head of research at the BIS, White is listened to with respect around the world. >>> Between 1933 and 1945 the BIS board of directors included Walther Funk, a prominent Nazi official, and Emil Puhl, who were both convicted of war crimes at the Nuremberg trials after World War II, as well as Hermann Schmitz, the director of IG Farben, and Baron [Kurt] von Schroeder, the owner of the J.H.Stein Bank, which held the deposits of the Gestapo. 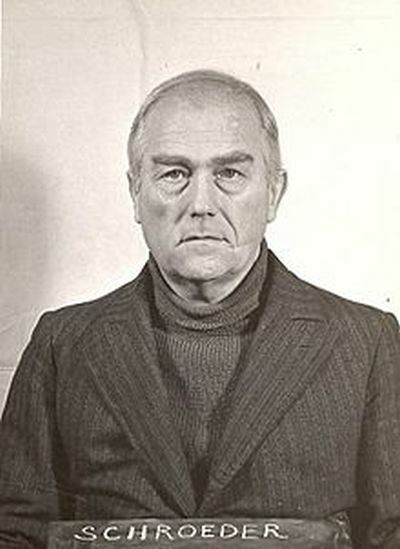 There were allegations that the BIS had helped the Germans loot assets from occupied countries during World War II. As a result of these allegations, at the Bretton Woods Conference held in July 1944, Norway proposed the “liquidation of the Bank for International Settlements at the earliest possible moment”. This resulted in the BIS being the subject of a disagreement between the American and British delegations. The liquidation of the bank was supported by other European delegates, as well as the United States (including Harry Dexter White, Secretary of the Treasury, and Henry Morgenthau), but opposed by John Maynard Keynes, head of the British delegation. 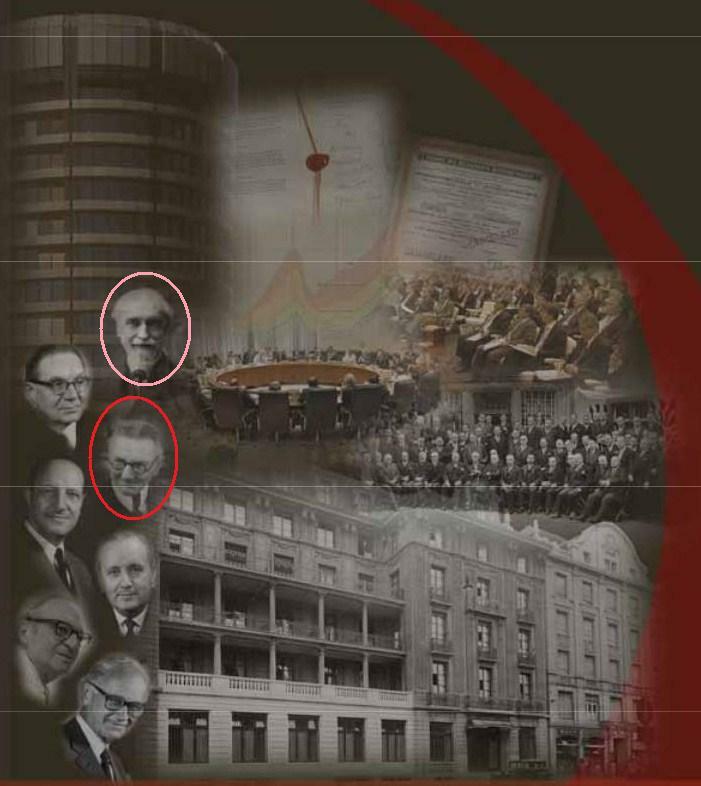 …And here the secret history of the BIS and its strong relationship with the Bank of England becomes ever more murky. During the war the BIS proclaimed that it was neutral, a view supported by the Bank of England. In fact the BIS was so entwined with the Nazi economy that it helped keep the Third Reich in business. It carried out foreign exchange deals for the Reichsbank; it accepted looted Nazi gold; it recognised the puppet regimes installed in occupied countries, which, together with the Third Reich, soon controlled the majority of the bank’s shares. Every other month it hosts the Global Economy Meetings, where 60 of the most powerful central bankers, including Mark Carney, Governor of the Bank of England, meet. No details of meetings are released, even though the attendees are public servants, charged with managing national economies. So as you can see, beyond the public theater offered in Ukraine and the Middle East, and beyond all the East versus West propaganda offered in the mainstream and alternative media, China and the BRICS are dancing to the tune of the BIS puppet masters just like everyone else. There is NO CONFLICT between “Nazi/Zionist” transatlantic bankers and BRICS bankers. In fact, Chinese and Russian banks (along with everyone else) are in the process of implementing the Basel 3 bank reforms put out by the Basel Committee on Banking Supervision, which is hosted by the BIS. All this being said, when will the crash begin, and how long will it last? Given that the last crash lasted from 2007-2009 and contained a shocking “Lehman Moment,” it stands to reason that the next crash would also be a slow-motion train wreck with an even more shocking Lehman Moment. If the propaganda setup for the collapse is any indicator, the train wreck and New Lehman Moment will involve the raising of the Fed interest rate by Janet Yellen and perhaps a black swan event like a false-flag cyber attack or terrorist attack. Looking at the interest rate component, the Fed will be meeting this Tuesday and Wednesday (September 16-17), and that could give us an indication of when things might kick off. The general consensus of the Fed watchers seems to be that interest rates will go up starting in the summer of 2015, with some estimates saying as early as March 2015. Will this start the train wreck? And since the BRICS bank isn’t scheduled to start lending until 2016, the New Lehman might not happen till then. But then again, they can always surprise us. Bitcoin: The New World Order’s Plot For A World Currency?